We have remodeled our entire bathroom. Plumbing and drywall is finally up. Now for taping and mudding and then tile, and now I'm worried about what paint I should use. The tub surround and toilet are white. The vanity is medium wood and the tile is a beige brownish with white. Can someone please give me some ideas? Thanks. My suggestion would be to keep within your brown/beige tones. 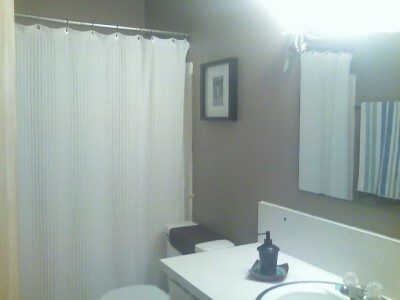 An accent wall "Bison Brown" and rest of the room "Mississippi Mud" Behr product from the Home Depot. Suggestively I would use a satin sheen mold and mildew resistant. Those are the two I used in my guest bath, you might want to go to the Home Depot color center and see what they have within your countertop and tile colors. I like what justatypn said. It's similar to my bath (see pix) Be sure to use some type of scrubable paint, anything but flat, so you can keep in clean. We still need to replace the sink and counter with ours, maybe this winter. I love the differences in people. One lady says stay within the browns and I say put out any color in the world that you like because your colors are so neutral. I think if you do brown family your bath will fade into the sunset and not do it justice. But again, some people are more adventurous that others with color. You don't have a whole lot to lose in the cost of towels, shower curtain, rugs, etc. If it were me, I'd go with warm colors; golds, terracotta, warm soft reds with no blue in them, and green absolutely. Pistachio, emerald, moss, sage, etc. In my opinion, you should enjoy every room like a party. Go on the JC Penney site and see the different colors they offer; also Target, Walmart, and Macy's, the high end stores, too. Warm that room up. Good luck and if you can, please send us a picture, OK? I need paint advice. My bathroom has a white tub and toilet, new greenish/blue matte tile (has different patterns in each tile and changes with the light) in shower and on floor, white cottage vanity with cream/sprinkly top. I am tying this in with the shower curtain: striped, lots of blue, some red, some gold, and some honey color. What color should I paint the walls? What color should I paint my bathroom walls? The countertop is turquoise (which I hate), with a beige toilet and shower/tub. I have a blue and brown shower curtain that matches the countertop, as best as I could. Have you thought about a theme? Like the beach? those colours remind me of the beach. Maybe sand colour paint? If you only have a little bit of wall, what about picking up some of the cheap thin beadboard from HD. Paint in a wash of white then go over with a light turquoise to get in the groves and wipe down, then another coat of white wash to dull the blue tone. Put up pictures with black frames to draw the eyes to them vs the counter. If you have shells, etc. from the beach make a shadow box and display. If counter is large: consider making a tray for the counter to put the various things on. Use a basket to put a plant in. Desert is another idea, southwestern. You can pull in peaches, terracotta, and sands. If you don't like the beach idea then you need to think of ways to bring in the turquoise and have it blend/disappear. Find some art work that has the colour, but use the other colours to pop them to the front. Do you sew? Do plain curtains and make a patch work strip using a little print with the turquoise and bring in other colours. I am painting my bathroom and looking for input. I am looking to paint it a blue color, maybe. I have a dark cherry cabinet, black granite countertop, dark blue mixed with lighter blue vessel sink and white tile floor. What color should I paint the walls? I think blue is a great idea, but probably a lighter shade. However, blues are very hard to match, so go to your local paint store and in the shade (degree of lightness/darkness) you think you'd like, get lots and lots of samples. Go home and put them one at at time on that lovely bowl. When it's not the right blue, there will be a bit of a "jarring" note. When it's the right blue, it will just "fit". It's the eye, doing the telling, so you can only tell actually seeing the colors together. Personally, wallpaper sounds like a better idea to me. The image I get from your description sounds luxurious. I would want to play that up with wallpaper not play it down with paint. You can find a lot of very wonderful wallpaper for a lot less than what is currently "popular". You could even pick 2 coordinating papers to work in together, or even one wall papered like the one that's most often faced and looked at or the wall seen as you enter the room. Also, wallpaper will help keep a room warmer. My mom taught me that. She used to own rental houses and apartments, so she knew a lot of "insider tricks". She hung most of the wallpaper at my old house and told me flannel backed paper was a better deal for such an old (170+ yr old house). Another trick was to not strip off old wallpaper so it became a little bit of added insulation (so to speak). Some people would faint to hear that, but if it's in good condition, smooth, untorn, not bumpy and so on you really can't see. Plus I ran into old walls in my old house that I regretted starting removing wallpaper, because some of the plaster started coming off in chunks as the paper was taken off. It was actually holding the wall together. I say light grey or blue. Anything dark is going to box it in. Light beige or taupe would be perfect for your bath. Otherwise, I suggest creamy white as the others have suggested. You already have a lot of dark colors going on there. So you'll want to add some light to offset that. I am helping a friend remodel her master bathroom. The sink: white, counter top: granite, black with small blue flecks, walls: light gray. I want to paint the walls in my bathroom. The tiles around the bath are white with little squares of black and a light green and a blue green. The tiles on the floor are a grey black.